The American-Canadian band Arcade Fire (let’s steer clear of too many typecasts here, they make music) have been together in some shape or form since they recorded their debut EP, a self-titled, self-released affair with seven tracks featuring original members Win and Will Butler, Régine Chassagne, Josh Deu, Richard Reed Parry and others from their art and music circles in Montreal, Quebec. With their fortuitous blend of multi-instrumental skill, intense song writing and passionate vocal style allied to promising live shows they created the perfect opener in Funeral, a disc that became an obsession with their fans and sold over a million copies, despite being on the independent label Merge. As demand for their presence became a phenomenon Arcade Fire took their extraordinary array of tunes and instruments to the people and wowed festival goers from Coachella to Leeds, Lowlands in the Netherlands to Vegoose and Reading. No longer any kind of well-kept secret their magnificent collaboration with David Bowie on the latter’s “Five Years” at the Fashion Festival in 2006, a mutual love affair with U2 during the `Vertigo Tour and outstanding end of year poll showings rubber stamped their status. The subsequent discs Neon Bible, The Suburbs and Reflektor saw them touch Platinum and Gold and top charts worldwide in the process. Offshoot projects include the soundtrack to Spike Jonze movie Her, a version of Peter Gabriel’s “Games Without Frontiers” for his tribute album And I’ll Scratch Yours, backing up Mick Jagger on Saturday Night Live and an NBC special that featured cameo appearances by Ben Stiller, Bono, comedian/actor Bill Hader and others. They have won two BRIT Awards (for The Suburbs, as Best International album and group), two Grammy Awards (The Suburbs again), and numerous Canadian Juno Awards. Suffice to say that in the space of a decade Arcade Fire have become one of the key bands whose intelligent and sometimes provocative dedication to their work turns fans into fanatics and draws newcomers under their spell. Win Butler and Josh Deu were the founding force in the very early incarnation of Arcade Fire having met at the prestigious New Hampshire school, Phillips Exeter Academy. Texan Butler struck up a friendship with Chassagne during rehearsals at McGill University in Montreal. She and Butler married in 2003. Their self-titled debut was recorded in Maine with Butler’s younger brother Will adding a dynamic element to their sound and image. The EP’s best-loved song “No Cars Go” would be re-recorded later for Neon Bible. In any case while this wasn’t as polished as later releases it includes many of their most notable elements: a variety of keyboards, clarinet, banjo and all manner of exotic percussive effects. If that debut hinted at what was to come then Funeral delivered the lot. Generally acknowledged to be a modern classic and a must-hear disc if it passed you by (how?) then discovery won’t go amiss now. Other core members featured here areTom Kingsbury on bass and guitars, Richard Reed Parry – a force of nature in his own right who plays just about everything and produces and engineers – violinist Sarah Neufeld and others. All the tracks are outstanding with the three “Neighbourhood” pieces containing all the rhythmic thrust and lyrical power that characterise classic Fire. The most famous song is probably “Wake Up” (over 10 million hitters on YouTube can’t be wrong) but “Rebellion (Lies)” runs it close with a throbbing Joy Division inflected bass line and an overarching Gothic mood that simply pulls you along. It has become their natural concert finale and remains one of the greatest indie anthems of recent years. Still on Merge Arcade Fire made Neon Bible with producer Markus Dravis in Quebec, London, New York and Budapest and hit all the buttons from claustrophobic panic to full blown grandiose endeavour. More baroque than rock and roll in the old sense the songs here take a not too cool look at America via communications media and incorporate strands of Americana via Bob Dylan, Bruce Springsteen and Elvis Presley: tradition updated. The folky and spooked “Keep The Car Running” could almost have been on Born to Run, if that album had met Talking Heads Fear of Music. What makes it tick, since tick over it does? Chassagne’s hurdy gurdy rhythm is essential but so are the almost buried in the mix guitars and strings. Needless to say Bruce and Arcade’s Win Butler and Chassagne have played it together in Ottawa and Foo Fighters have it covered. Just as esoteric is “No Cars Go”; released on 7” vinyl, while the mind-boggling “Intervention” has a hymnal quality that belies its bleak lyric. Dealing with spiritual scams in general and the folly of the gullible in particular Neon Bible is itself an addictive charmer and a huge favourite in the UK where over 300,000 purchasers have kept the faith. The major label debut The Suburbs hit the heights in the UK and US. Offering over an hour of music this needs to be checked on the Deluxe edition where Arcade Fire collaborate with David Byrne on “Speaking in Tongues” (a Talking Head album title but not an actual track by them). With Neufeld now fully integrated into the writing and compositional process and Jeremy Gara bossing the drum kit this is the band’s most percussive and playful disc with a lyrical slant drawn from the Butlers childhood in The Woodlands, Texas (some of it was recorded with Drakus in Austin). With its careful and clever metaphors dealing with life in the 20th and 2st centuries and an inevitable nostalgia surrounding the brilliant “Ready to Start”, “City With No Children” and the bizarrely simplistic yet ambiguous “We Used To wait” this is a disc that repays reinvestigation. So to Reflektor, released 2013, whose secretive influences include Chassagne’s Haitian roots, dashes of philosophy and the movie Black Orpheus. Part produced by LCD Soundsystem’s James Murphy this time the barrage of instrumentation creates an electronic and heavy atmosphere. Bowie returns to add a vocal to the title cut – he was much taken by the song’s rhythmic ambition – and Owen Pallett’s usual arranging skills augment a disc that became their second #1 in the UK and the US. The human rights track “We Exist” and the dreamy “Afterlife” are as challenging as anything from Butler’s pen and the band excel on a sprawling 2-CD set that encompasses everything from concertina and glockenspiel to celeste and mandolin. It’s a form of classic world music wrapped up in 85 minutes plus of essential noise with deep danceability and elements of British 80s rock. No new album is in the pipeline at time of writing but given their usual modus operandi the fifth Arcade Fire disc could be set for 2016. We are certain it will be worth the wait. In the meantime there’s plenty of opportunity to discover a wealth of good stuff and cherish those anthems again. 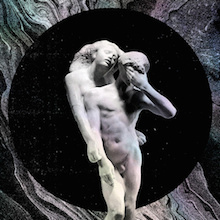 After stunning the mainstream pop machine into a state of huffy, new school e-disbelief by beating out Eminem, Lady Antebellum, Lady Gaga, and Katy Perry for the 2011 Album of the year Grammy, Arcade Fire seemed poised for a U2-style international coup, but the Suburbs, despite its stadium-ready sonic grandiosity, was far too homespun and idiosyncratic to infect the masses in the same way as the Joshua Tree or Achtung Baby. Reflektor, the Montreal collective's much anticipated fourth long-player and first double-album, moves the group even further from pop culture sanctification with a seismic yet impenetrable 13-track set (at 75 minutes it’s one minute over standard single disc capacity) that guts the building but leaves the roof intact. Going big was never going to be a problem, especially for a band so well-versed in the art of anthem husbandry, and they're still capable of shaking the rafters, as evidenced by the cool and circuitous, Roxy Music-forged, David Bowie-assisted title cut, the lush, Regine Chassagne-led “It's Never Over (Oh Orpheus),” and the impossibly dense and meaty “We Exist,” but what ultimately keeps Reflektor from sticking the landing is bloat. The stylistic shifts, courtesy of LCD Soundsystem's James Murphy, aren’t nearly as jarring as the turgid and Tiki-colored, almost seven-minute “Here Comes the Night Time,” the six minutes of rewinding tape that serve as the coda for the otherwise lovely “Supersymmetry,” or the unnecessarily drawn-out fountain of white noise that should seamlessly connect the Gary Glittery “Joan of Arc” with the Flaming Lips-ian “Here Comes the Night Time, Pt. 2,” but doesn’t because the songs are on separate discs. Flush with artistic capital, they went on a bender, and in the process lost some of the warmth, jubilation, and capacity for empathy that made their first three efforts so inclusive. Nevertheless, Reflektor is as fascinating as it is frustrating, an oddly compelling miasma of big pop moments and empty sonic vistas that offers up a (full-size) snapshot of a band at its commerical peak, trying to establish eye contact from atop a mountain. 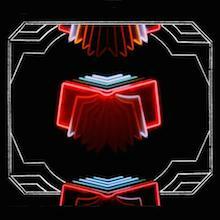 Montreal’s Arcade Fire successfully avoided the sophomore slump with 2007’s apocalyptic Neon Bible. Heavier and more uncertain than their near perfect, darkly optimistic 2004 debut, the album aimed for the nosebleed section and left a red mess. Having already fled the cold comforts of suburbia on Funeral and suffered beneath the weight of the world on Neon Bible, it seems fitting that a band once so consumed with spiritual and social middle-class fury, should find peace “under the overpass in the parking lot.” If nostalgia is just pain recalled, repaired, and resold, then The Suburbs is its sales manual. Inspired by brothers Win and William Butler’s suburban Houston, TX upbringing, the 16-track record plays out like a long lost summer weekend, with the jaunty but melancholy Kinks/Bowie-esque title cut serving as its bookends. Meticulously paced and conservatively grand, fans looking for the instant gratification of past anthems like “Wake Up” or “Intervention” will find themselves reluctantly defending The Suburbs upon first listen, but anyone who remembers excitedly jumping into a friend’s car on a sleepy Friday night armed with heartache, hope, and no agenda knows that patience is key. Multiple spins reveal a work that’s as triumphant and soul-slamming as it is sentimental and mature. At its most spirited, like on “Empty Room,” “Rococo,” “City with No Children,” “Half Light II (No Celebration),” “We Used to Wait,” and the glorious Régine Chassagne-led “Sprawl II (Mountains Beyond Mountains),” the latter of which threatens to break into Blondie’s “Heart of Glass” at any moment, Arcade Fire makes the suburbs feel positively electric. Quieter moments reveal a changing of the guard, as Win trades in the Springsteen-isms of Neon Bible for Neil Young on “Wasted Hours,” and the ornate rage of Funeral for the simplicity of a line like “Let’s go for a drive and see the town tonight/There’s nothing do, but I don’t mind when I’m with you,” from album highlight “Suburban War.” The Suburbs feels like Richard Linklater’s Dazed & Confused for the Y generation. It’s serious without being preachy, cynical without dissolving into apathy, and whimsical enough to keep both sentiments in line, and of all of their records, it may be the one that ages so well. 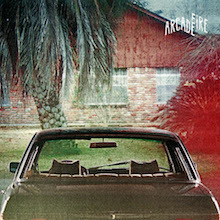 When Montreal's Arcade Fire released Funeral in 2004, it received the kind of critical and commercial acclaim that most bands spend their entire careers trying to attain. Within a year the group was headlining major festivals and sharing the stage with U2 and New York City's "two Davids" (Bowie and Byrne), all the while amassing a devoted following that descended upon shows like sinners at a tent revival, engaging in the kind of artist appreciation that can easily turn to a false sense of ownership. On their alternately wrecked and defiant follow-up, Neon Bible, one can sense a bit of a Wall being erected (Win Butler's Roger Waters/Bruce Springsteen/Garrison Keillor-style vocal delivery notwithstanding) around the group. If Funeral was the goodbye kiss on the coffin of youth, then Bible is the bitter pint (or pints) after a long day's work. The brooding opener, "Black Mirror," with its sinister "Suffragette City"-inspired groove and murky refrain of "Mirror, Mirror on the wall/Show me where them bombs will fall," sets an immediate world-weary tone that permeates that majority of Neon Bible's Technicolor pages. As expected, those sentiments are amplified with all of the majestic and overwrought power that has divided listeners since the group's ascension to indie rock royalty, but despite a tendency toward midtempo balladry and post-fame cynicism, they're anything but dull. It's the triumphant orchestral remake of live staple "No Cars Go" and the infectious "Keep the Car Running" -- the latter sounds like a 21st century update of John Cafferty & the Beaver Brown Band's "On the Dark Side" -- that will most appeal to Funeral fans, and when the bottom drops out a minute and a half into the pipe organ-led "Intervention" and Butler wails "Who's gonna reset the bone," it's hard not get caught up in all of the dystopian fervor. "Black Wave/Bad Vibrations" and "The Well and the Lighthouse" continue the band's explorations into progressive song structures and lush mini-suites, the thunder-filled "Ocean of Noise" is reminiscent of Bossanova-era Pixies, and the stark (at first) closer "My Body Is a Cage" straddles the sawhorse of earnest desperation and classic rock & roll self-absorption so effortlessly that it demands to be either turned off or all the way up. Neon Bible takes a few spins to digest properly, and like all rich foods (orchestra, harps, and gospel choirs abound), it's as decadent as it is tasty -- theatricality has never been a practice that the collective has shied away from -- but there's no denying the Arcade Fire's singular vision, even when it blurs a little.